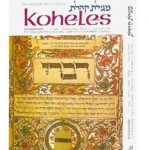 The 12th and culminating chapter of Kohelet (Ecclesiastes), read during Sukkot, has been called one of the most famous passages in all literature. ‘I have no pleasure in them’. The keepers of the house that start to tremble in old age are the arms. The strong men that bow themselves are the legs; the grinders that cease because they are few are the teeth, and those that look out but grow darker are the eyes. Kohelet goes on, “And the doors shall be shut in the street”, alluding to ears that hear less and less well; “when the sound of the grinding is low”, suggesting the failing power of the stomach to digest food; “and one shall start up at the voice of a bird” – even the sound of a bird can wake a light sleeper; “and all the daughters of music shall be brought low” – for musical notes sound soft if your hearing is impaired. You can readily imagine the lively Biblical preacher acting out his words in charade fashion before a crowd in the street. Good-naturedly, but with gentle cynicism, he depicts the ageing person, who “shall be afraid of that which is high, and terrors shall be in the way”. He continues, “the almond tree shall blossom” – his hair, such as he has left, has gone from grey to white; “the grasshopper shall drag itself along” – his sexual vitality has declined; “and the caperberry shall fail” – he now has little ambition and a diminished interest in things. It is daring, even impertinent imagery. 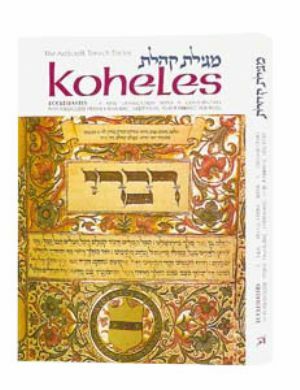 It be offensive and almost callous, but Kohelet does not overstep the bounds of good taste and as an elderly cynic himself probably succeeds in bringing a smile to the listener’s lips. And the spirit returneth unto God who gave it. This well-known verse is generally applied to assure mortals that earthly life is not everything, and there is a world to come where the soul, winging its way up from the body whose physical function is now at an end, finds it eternal rest with God. But Kohelet himself probably did not mean to indicate anything very positive concerning life after death, but rather than, in the cyclical process of nature, death is inevitable. When that time comes, body and soul separate for the individual, but the overall cycle of events keeps turning. This is far from the point of view of normal Biblical piety, for which “life is real, life is earnest”, and man has been placed on earth as God’s co-worker in the process of creation, capable of perfecting himself and making an impact on his environment. This entry is filed under Bible/Tanach, Festivals & Fasts, Sukkot. WordPress generated this page with 32 queries, in 0.226 seconds.